The list below, in our opinion, are must have table features when you are shopping for a quality table. The list below is provided for anyone looking to purchase a table that is wanting to take foosball seriously; It is not a list for anyone looking to purchase a toy for kids. 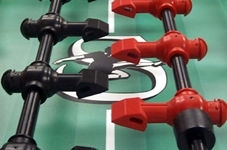 We created this list as a set of requirements in order to rank the best tables in our foosball table reviews section. Please read through this list of table features and qualities so you know what features you should spend your money on and what foosball table you should purchase. Heavy table weight of about 200 pounds or more and thick side rails of 1 1/2 inches. This feature will make your table more stable during heavy play and make for a higher durability of your table. Thinner and lighter tables will begin to flake around the goal posts after a year or two because of wear and tear from foosball shots. Light tables are also annoying because they will shift position during game play and you will constantly have to level your foosball table. Foosball men that do not have rounded, slick toes. You want to look for a foosball table with men that have a pointed toe and a cross-hatching design on the foot that allows for better ball control. This will allow you to catch the foosball and pin the ball down for advanced shots like the snake shot. The traditional man that has a round, slick toe design does not allow you to pass the ball to players back and forth on the same rod and is not conducive to shooting bank shots. Bank shots require a sharp edge on the man's toe because you need to hit the ball off the side at a sharp angle in order to hit a crisp bank shot. Counterbalanced or counterweighted foosball men is a feature you see in some of the higher-end tables and is a must have in our opinion. Counterbalanced men mean that there is a weight in the head of the man equal to the weight of the toe. 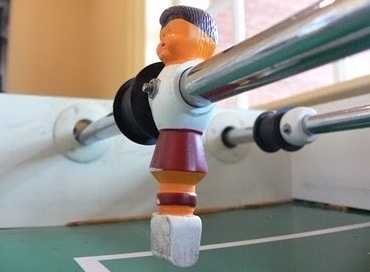 If your table does not have a weight in the head of the foosball men, it will be frustrating to play a one on one game. When you are on defense you will have to rotate your men all the way upside down vertically because the weight in the feet will make them fall down if you have them horizontal. You will also notice that the heads of your own men will block your shots that have a lift on them. With counterbalanced men, you will be able to rotate your men horizontally and they will stay in that position and out of your way. Counterbalanced men also add a little bit of speed to your shots. Wooden handles. Wooden handles with an octagonal shape allows for a better hand grip and more effective shooting. It also allows you to perform more advanced foosball shots. With plastic handles, you are more likely to have accidental spins because your hand will slip loose from the rod. Adjustable legs. Adjustable legs allow you to spin a threaded leg leveler at the base of the leg in order to raise or lower your table. This is important to easily level the foosball table, which will make for a more competitive and fair game. Having a level playing field is ideal for all aspects of the game from the serve to setting up your shots. Side ball returns. Side ball returns are not necessarily a deal breaker when it comes to having the right table because it does not affect the actual game play. This is more of a convenience factor that a lot of higher-end tables come equipped with. The ball returns that are at the end of the ball table are not as desirable due to 3 reasons: you cannot position your table close to the wall in your game room to keep it out of the way, you have to reach around to the side of the table when you are practicing foosball by yourself, and many end ball returns cause the ball to fall out on the floor. The side ball returns solve all 3 of these common problems and makes your table a little more user-friendly. Tacky (sticky) foosballs. 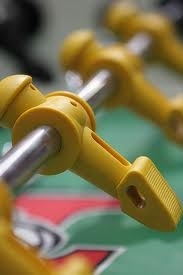 You want to find a foosball ball that can be easily gripped or pinned down against the table with your foosball men. You should stay away from balls made of plastic or with a slick, shiny finish. All foosball tables over $500 come standard with good quality balls. However, the nice thing is this is one of the few foosball parts that is extremely easy and cheap to upgrade.